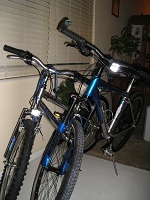 the pictures show it holding our tandem. 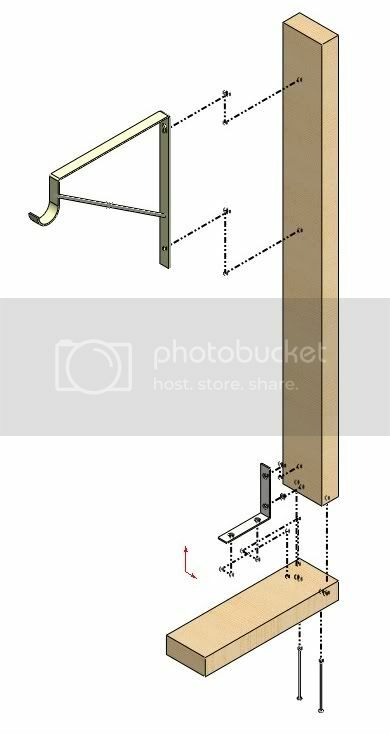 I purchased two closet shelf brackets with hanger rod features and an 8' 2x4 from Home Depot. I already had 3" angle brackets, nails, screws and clamps. The 2x4 was cut into two pieces about 3' long and two pieces about 1' long. One of each was assembled into the 'L's using nails, then the screwed on angle brackets. The shelf brackets were positioned near the top. Foam was added to the rod support area to prevent scratching of the bike. A piece of plywood was attached to prevent side to side motion of the bike - didn't work so well with the steep seat post of the tandem - I'll be adding a foam covered L bracket soon. I had this clamped to my work bench - ended being a bit high. I found a couple of scrap aluminum assemblies to clamp it to, which puts the bike at a good height for me. I think I like it - but do you have any pics without the bike attached? Maybe I can get a better idea that way. Sorry, not yet. I will take some after I get back from China, around Memorial Day. (05-10-2011, 03:14 AM)nfmisso Wrote: Sorry, not yet. I will take some after I get back from China, around Memorial Day. Cool! Have a good & safe trip! That is soo cool! I may make one of these and I like the piece coming out mid level meeting the seat tube to keep it from angling! Nice stand for bike and appreciate your work.. Thank you Bill & Roger. the first one shows how it goes together; but not the screws for the brackets. The second shows it assembled. It takes two to make the stand. The piece coming out is just an old piece of plywood screwed to the 3 ft 2x4. A bungee cord is sufficient to hold the bike in place. I put dense foam on every contact surface to protect the bike. So simple... and effective! Great idea, Nigel. Thanks for sharing the CAD drawing. I see a bike stand in my near future. Yea thats pretty cool cad diagram.